GALION — The Jonathon Alder Pioneers were in town Tuesday to meet up with the Galion Tigers on their home volleyball court. Alder, the 2016 Mid-Ohio Athletic Conference Red Division champions, needed just three sets to knock off the Tigers and spoil senior night; 25-17, 25-15, 25-17. With the defeat, Galion ends the regular season at 8-13 and 6-6 in the MOAC Red. For seniors Morgan Gregory, Callie Wildenthaler, Aleena Truman, Dusty Thomas and Chloe McCleese, this was the last regular season match at home. For more photos from Senior Night, visit our online gallery. Galion gained 15 points off of the serve against a pesky Pioneers defense. Morgan Gregory had five of those points on 7/9 serving. Marisa Gwinner added a perfect 10/10 serving with three points and one of the Tigers’ two aces on the night. The other ace came from the serving of Callie Wildenthaler. Wildenthaler was 6/6 serving on the night with the afore mentioned ace and one point. 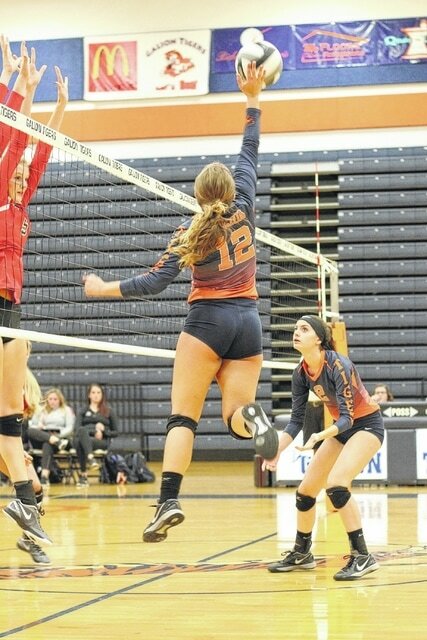 Chloe McCleese also contributed 7/7 serving and a point for Galion. Gwinner, Gregory and McCleese were also busy on the attack for the Tigers. Gwinner lead the attack for Galion, going 15/17 with nine kills. Gregory was 5/6 on attack attempts and grabbed five kills. She was also the primary setter, going 67/71 with 13 assists. Senior McCleese tacked on four kills on 17/19 hitting. The Tigers recorded just 21 total kills as a team against Alder. The Pioneers’ size up front thwarted the Tigers’ attack with seven blocks at the net. Defensively, Johnathon Alder did their best to keep the Galion squad busy. In total, the Tigers recorded 57 digs on the night against a thunderous Pioneers’ attack. Nicole Thomas found herself at the tail end of 16 digs for the match. Wildenthaler picked up 14 digs and Abby Foust contributed 13. Dusty Thomas, Gwinner and Gregory also had blocks at the net for the home team. Even through Galion’s best efforts, Alder still threw down 42 kills for the match. The Pioneers also picked up seven aces while serving. Galion loads the buses tonight for a short trip to Northmor High School to meet up for their MOAC Crossover event. This will be the final matchup for the Tigers before hosting Bucyrus in sectionals competition next week.